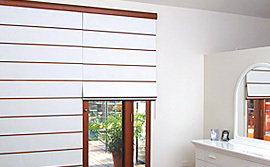 At Peachester we can supply all of your internal fabric blind needs. All blinds are available in a huge variety of fabrics from Mesh, Translucent, Semi or full Blockout. There is also a massive range of colours and designs to suit any décor. All Peachester fabric blinds incorporate premium quality components in their operating systems whether manual or motorized ( remote control ) so that the blind you choose will last and look like new for years to come. The team at Peachester will bring all samples of fabrics and colours to your home so that easy matches can be made against the existing furniture, paintwork and carpets etc.